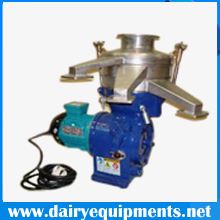 We are the top Manual Butter Churners Manufacturer & supplier of India. These are immensely demanded for domestic applications as well as very small scale dairies especially in the states of India like Uttar-Pradesh, Rajasthan, Gujarat, Punjab and Andhra-Pradesh. We offer them in different capacities such as 20 liters, 40 liters, 60 liters etc. This churner is very effortless to operate, clean and maintain due to its unique user-friendly & maintenance friendly design. We manufacture them with the aid of high quality materials as well as the most up-to-date technology as per the industrial norms. These are also quality tested to ensure that we do not offer flawless products to our customers. We offer this robust, durable and effective butter churner at competitive rates. Dynamically balanced steel made of AISI 304 Stainless Steel. Appropriate for small scale dairies.